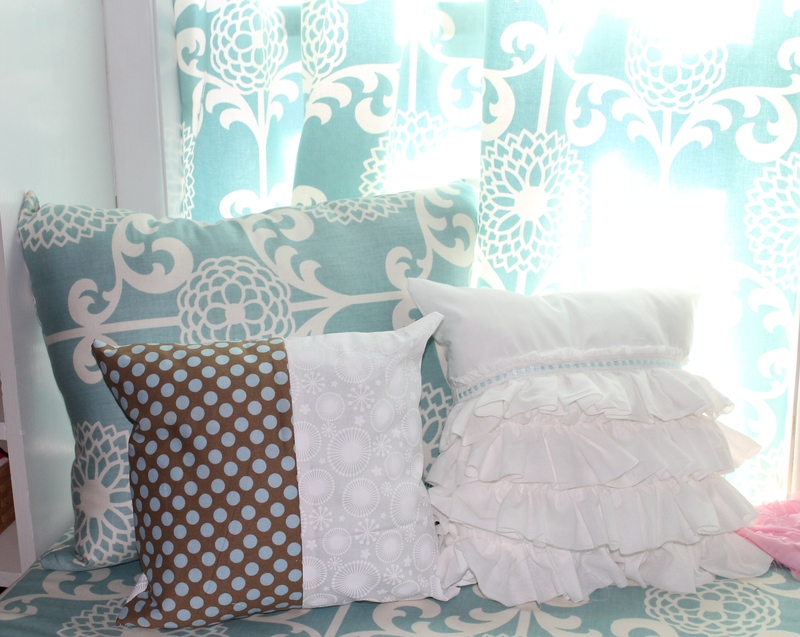 A few weeks ago, I finally finished making the curtains and cushion for my window seat in my closet, and I decided to go ahead and make a few pillows. This window is an outside window that faces the highway, so it really needed curtains. I found the fabric at JoAnn’s and found a tutorial online that showed how to make the corners and use only two pieces of fabric. You’ll have to excuse the imperfect sewing. I had never made a cushion before, and the next one I did used a different technique because I cannot sew a straight seam. I really can’t. I think I was the only girl in seventh grade that had to sew my first bag three times before it passed. Then I made this sun dress . . . well, if Al Gore had invented the internet in 1977, that dress would have been pinned all over the place as the perfect craft fail. But, I’m a pretty good problem solver, so I usually find a way to fix my own flaws, and I’m thinking of attaching ribbon around the seam to cover it, but that is for another day. In the meantime, here’s a look at my updated closet. 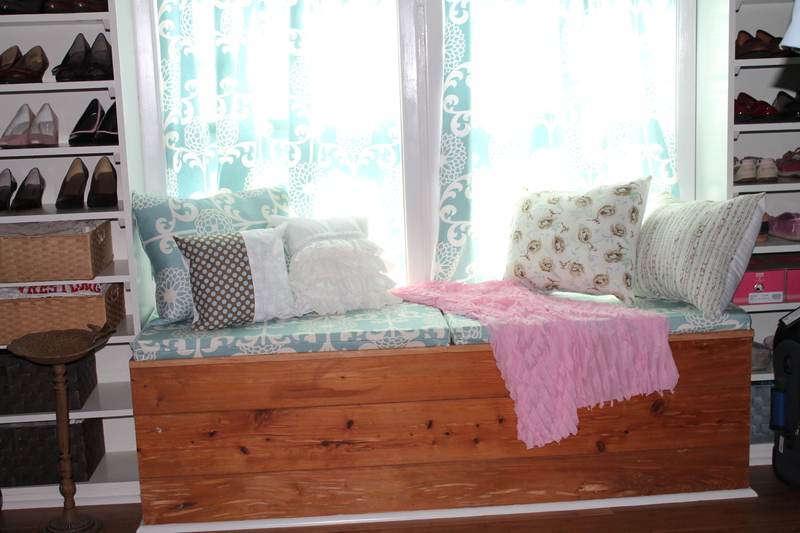 This is the window seat, and it is a great place to put on shoes. That little bird bath to the right is to hold my watch and pearls. I have a habit of losing them. I just haven’t actually developed the bird-bath habit yet. I really love this fabric. It is one of the home decor fabrics (Waverly, I think) at JoAnn’s, and they put these on sale frequently. I used five yards with some left over. The other pillows are made from scrap pieces. I bought inserts at IKEA for just a couple of dollars each, and it was nice to have them already sized and stuffed. 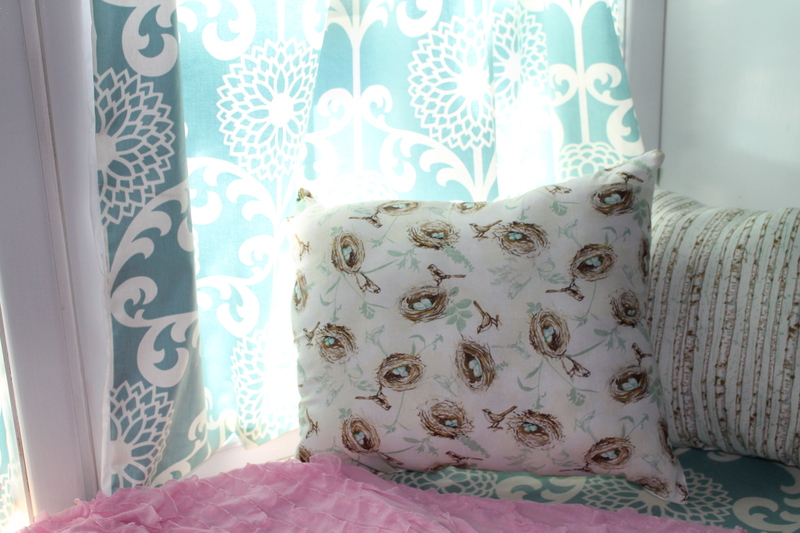 These two pillows are made from fat quarters that I got at JoAnn’s. I love the little bird’s nest. Honestly, I don’t have a thing for birds, but these seemed like such happy patterns. I think your closet should be a happy place. It’s where you start your working day and where you should feel good about yourself. This entry was posted in closet, home, Master Suite, organization, Uncategorized and tagged Al Gore, bench cushion, closet, closet organization, curtains, IKEA, Jo-Ann Stores, JoAnn, Pillow, Sew, Shannon, storage, Textile, window seat by Shannon. Bookmark the permalink.